Photo submitted by Pam DeCamp A group of children volunteers through PAAC at a previous Kruise-In. The Portsmouth Area Arts Council (PAAC) is revving up for its third annual celebration of kids and cars at their Kids Kruise-In this Friday, June 26, from 5:30 to 9:30 p.m. 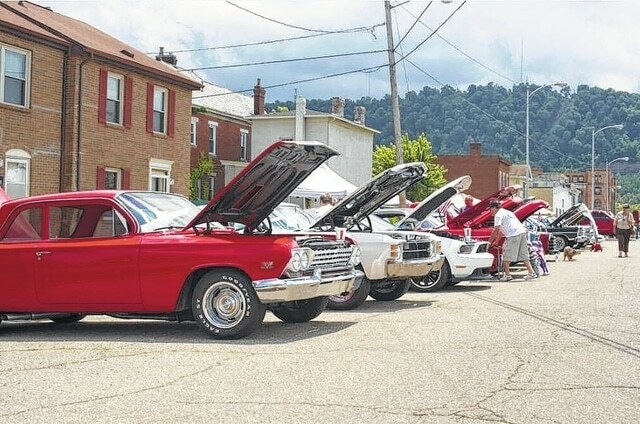 The idea behind the car show is that the cruise-in allows children the opportunity to examine cars up close that they might find interesting. Willis said that PAAC will also be hosting various vendors for adults, as well as music, inflatables and games for the family. There will also be food and drinks available. The previous events were held in the Valley Wholesale parking lot, due to PAAC not having a building of their own. Since last year, the organization has grown and has leased a space on Third Street, where the Portsmouth Area Children’s Theatre operates, and will be hosting the event. PAAC will be closing down the corner of Third and Court Streets to host the event. Moving the event to the new location also provided PAAC the opportunity to work more closely with Final Friday in Boneyfiddle, a monthly artistic and vendor fair that falls on the last Friday of the month. The group typically offers a themed dance on these days, but will be skipping the dance this month to devote time and resources to the car show. The group will also be having fun activities going on inside their location. It takes many sponsors with financial backing to make events like this possible, but the key players in this event include the Portsmouth Area Ladies (PALS) and Century 21 Realty. Admission is $2, but free tickets are available ahead of time at various locations, including Mary’s Spirit Shop, Patsy’s Inn Restaurant, PNC Bank, Pack Rats and Awesome Town, Haskins House, and American Savings Bank. All of the activities of the event will be held within 614 Third Street and on various parts of Third and Court Streets.